Like its counterpart in Pokémon X & Y, the Battle Maison includes the special Multi Battle mode. 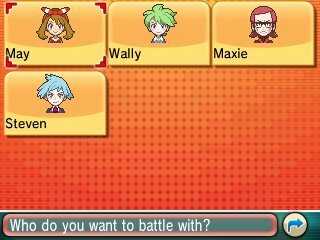 Here, you can participate in Double Battles against two trainers, selecting two of your Pokémon. When you begin, you first get asked if you wish to do this with a friend. This is done via local connections, starting with utilising the 3DS IR and allows for you to both challenge it at the same time. Your streak is reset if you do this.